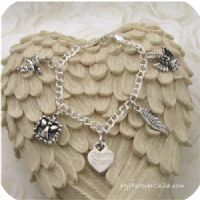 Our unique Angel Charm Bracelet is a gorgeous way to symbolize one or multiple losses. A small sterling silver heart charm in the center can have two names engraved (up to 8 characters). Specify engraving in the text box below. Other sterling silver charms: small Guardian Angel, Rustic Angel, Angel Wing, and Faith Angel charms.